Doux Reviews: Witches of East End: Marilyn Fenwick, R.I.P. Witches of East End: Marilyn Fenwick, R.I.P. "The first rule of witch club, don't talk about witch club." Who doesn't love a good grave robbing? Is it cat burglary if Wendy is in human form while it happens? With Freya still stuck in the painting, Aunt Wendy dead and Joanna stuck in jail, it's up to Ingrid to save them all. Great, except she doesn't know what the hell she's doing. What else was she supposed to do, but resurrect her Aunt? Even if she didn't need help with Freya, wouldn't saving a family member be second nature if it were possible? The three way mother/daughter spells scene was almost lovely. Like they were all working together even though they were far apart. We learned a little about the girls past lives' via Aunt Wendy while grave robbing. Apparently Ingrid has always been annoyingly smart, but not scared the way she is now. And she is terrified. It seemed that she was shaking and/or screeching through the entire hour. It says a lot when someone is the most calm while digging up a cemetery plot. Killian and Dash have ten shades of brotherly angst between them and not much else. They decided to spend this episode making sure we knew it. Dash thinks Killian should leave and is even willing to fund his way out of town, but Killian wants to stay and hang out with his brother's fiancee. Dash throws around a few threats just to make sure the audience knows that they really don't get along. In love triangle news, Freya goes to Killian's boat when she is upset and not her fiance's mansion. Bad Freya. Killian worries they can't ignore how they feel about each other and just be stargazing pals. Bad Killian. They both agree hugging isn't a good idea, because they might like it too much. Tsk tsk. No wonder Dash is feeling threatened. Since Joanna is in the clink and facing murder charges, she needs a lawyer. Enter Harrison, a fellow witch with whom Joanna shares a long and twisted history. While discussing bail money and the perks of being immortal, he happened to also mention that he doesn't have the power to do spells but does have the power to use his shady clients to get his long lost frenemy released from jail. It'll only cost $100,000. Time to dig up the family's money which has been tucked away in a cemetery for safe keeping, naturally. I mean that's where all my money is hidden. The Beauchamps decide to celebrate with cookies until Freya storms and Joanna realizes that Doug could've escaped the speakeasy painting. 2.5 out of 4 chocolate chip cookies. I loved the Bent Elbow as a speakeasy, but I'm partial to the 20s. Apparently being brought back to life makes you nauseous, not to mention feline 50% of the time. Strange. That never happens on Grey's Anatomy. I was proud of Freya for saving herself from the speakeasy painting. You go girl. Freya and Ingrid have never lived to be as old as they are now. How old are they? I could say something about Julia Ormond's over-the-top evil act when playing the shifter and how it lines up nicely with who the shifter turns out to be, but I don't know how without giving it away. I can already tell that finishing the season one reviews, it's going to annoy me that this show never lived up to its potential and got itself cancelled (in season two). 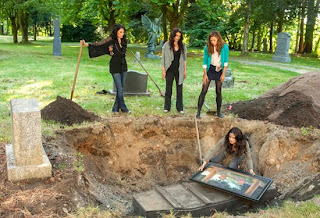 I literally laughed out loud when they made Freya help dig after being stuck in a painting and almost burning to death. Can't a girl catch a little rest time? Since Ingrid brought Wendy back, does that mean it doesn't count as one of her nine lives? Wendy: "If you resurrect someone you love, someone you love has to die." Killian: "I'm not mad at you." Dash: "You've been mad at me since birth. You never figured out that it's not my fault you're a screw up." Wendy: "All the women in this family have terrible luck with men." Ingrid: "And that's part of the curse?" Wendy: "No. We're just really stupid that way." Freya: "But you don't even believe in that stuff." Ingrid: "Let's just say that it's been a night of extreme cognitive dissonance." Wendy: "Do you have my clothes? It's colder than a witch's teat back here." Ingrid: "It's a curse. We are literally cursed."